Integrating workforce management and payroll systems. Handling complex pay rules and policies. Making sure that supervisors edit and approve employee time cards. Manually processing exceptions at the end of pay period. Keeping track of employees with different statuses. 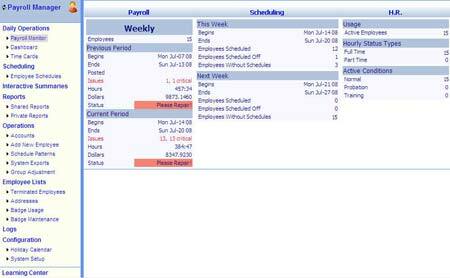 Payroll Monitor gives managers the big picture for payroll readiness. Payroll managers can access extensive time and attendance features. The dashboards, menu items, and summaries were designed around your responsibilities and priorities, making it easier for you to do your job. The Payroll Monitor provides real-time payroll and HR information and simplifies the payroll process. Critical issues are customized for your priorities. And, you can correct errors prior to payroll with just two clicks. The Labor Dashboard puts daily schedule totals for the entire organization at your fingertips. Payroll integration ensures collaboration with your payroll provider. Optional Benefit Accrualsmodule automates calculations of time off hours and improves the accuracy of employee benefit information. With the Leave Management module, the request and approval process is automated, and you don’t have to get involved. Interactive summaries display the employee summary information you need and export data to Excel with a single click. Online management reports help you track and analyze labor data. Pay rules automatically implement your complex HR and payroll policies. Comprehensive compliance management helps you adhere to important regulations such as the Family and Medical Leave Act (FMLA) and the Fair Labor Standards Act (FLSA).